Queelister's Place: Cherry on Top!! Here is my card for the Clearly Delightful Challenge #10, the challenge there is to use one of their images and ribbon. The sketch is from PCP's Saturday Sketch challenge. If you follow my blog you'll see that I CASED this from my Designed 2 Delight card. I really enjoyed this sketch, it's so clean and simple. What a fun and cheerful card! Love the cheery trio! Thanks for playing CDBC10! Lovely cherries, cute. Love how you did the ribbon. Thanks for joining us at Clearly Delightful for the monthly challenge. How pretty! 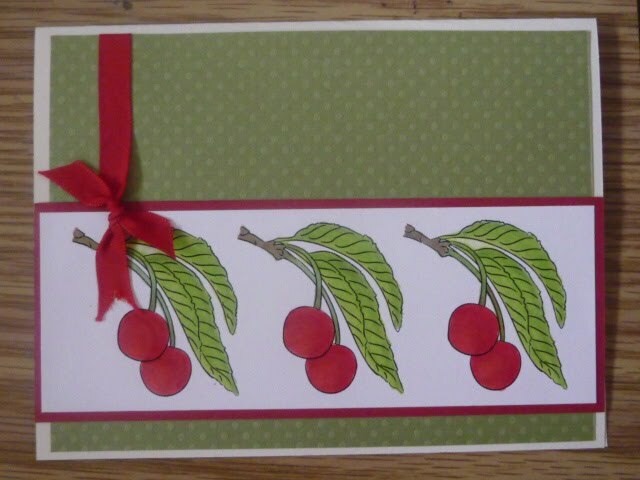 Your red ribbon looks great with the cherries. Thanks for joining us at the Clearly Delightful Challenge!